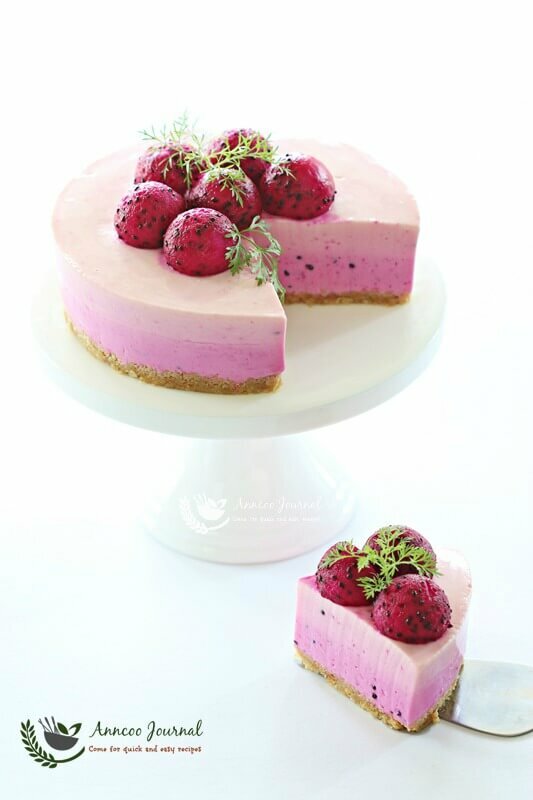 This pinky and elegant no-baked red dragon fruit cheesecake looks very pretty in double layers. Being only 6 inches, this is a very small cake. You will definitely not believe how easy it is to assemble the two layers in a mere 15 to 20 minutes. Although there are white chocolate and sugar in the recipe the cake is not very sweet but with a hint of cirtusy lemon. Best to serve this lovely classic cake for girly’s birthday or home gathering. Biscuit base - Grease the sides of a 6 inch removable cake pan and line the bottom with parchment paper. Blend biscuits coarsely and mix well with melted butter (add little more butter if you find the crumbly biscuits are too dry). Pressing the biscuit crumbs with your hand at the bottom of the lined cake pan. Put the tin in the fridge for later use. Melt white chocolate under double boiler and stir till to smooth and leave to cool. Melt gelatin under double boiler and keep warm. 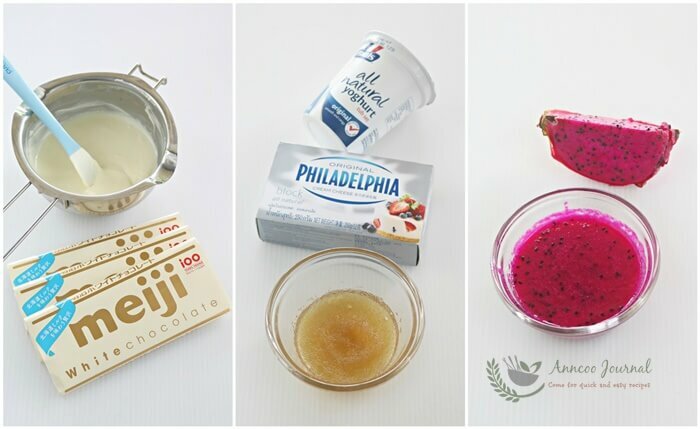 Place cream cheese, natural yogurt, melted white chocolate, icing sugar, lemon juice and vanilla extract in a food processor and blend until smooth. Then continue blending and pour in melted gelatin and blend mixture well again. Divide cheese filling mixture into 2 portions. Add 3 tablespoon of red dragon fruit puree into one of the plain cheese mixture. Gently stir well with a hand whisk and pour into prepared cake pan and spread evenly, then place into freezer for about 15 to 20 minutes to semi set. Add 1/2 tablespoon of red dragon fruit puree (for a lighter colour) into the remaining plain cheese mixture and gently stir well. Then take out the cake pan from freezer and gently pour the second layer of cheese mixture (step 5) on top of the semi set cheesecake. 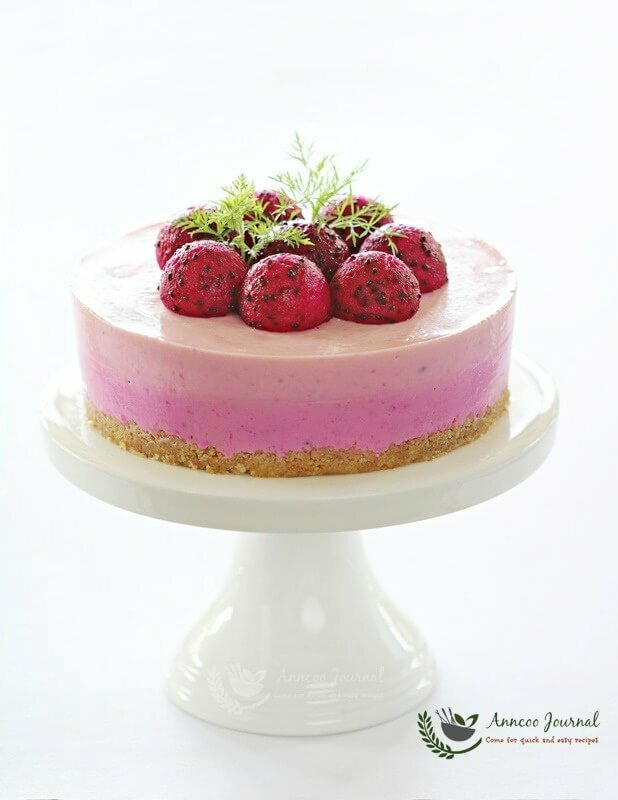 Refrigerate the whole red dragon fruit cheesecake for a few hours or overnight. Decorate the cake as desired before serving. If I were to bake this in an 8 inch cake pan, do I use 1.5 times of the above recipe? Hi Joyce, yes you can use 1.5 times of the recipe for an 8 inch cake pan. excuse me Ann, concerning of sweetness; can i omit icing sugar or white chocolate for less sweet variety? would it interfere with the batter’s overall consistency for a less sweet to more bland variety? because i was thinking of re-creating this without white chocolate and icing sugar; allowing only dragonfruit’s natural sweetness to come through, even though i know there’s less flavour from the fruit. thank you and much appreciate for sharing this amazing recipe. Hi Max, Is really up to you to recreate the recipe with less sugar or white chocolate. You’ll know what the cake taste like after making the cake. that’s true. just wish to know if omitting the sugars may result in a less firm consistency of a finished product? You can just omit the sugar and white chocolate but mind you, the cake is very bland. Hi Ann, thanks for the lovely recipe. I tried it yesterday and left it over night in the fridge. However when I cut it just now, it’s still very moist. What have I done wrong? Not enough gelatin, because when I add into the mixture it’s slightly hard. Can I add in before it garden, meaning still hot? Hi Machere, Actually 15g gelatin is more than enough for this recipe, plus the white chocolate will helps the batter set a little. Is better to keep the melted gelatin warm before pouring it into the mixture. 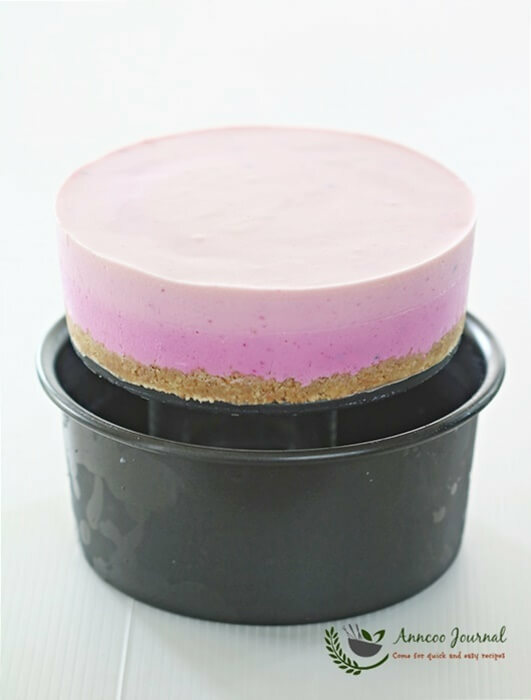 Anyway, if you want your cheesecake to be more firm, can increase the gelatin to 198 – 20g. 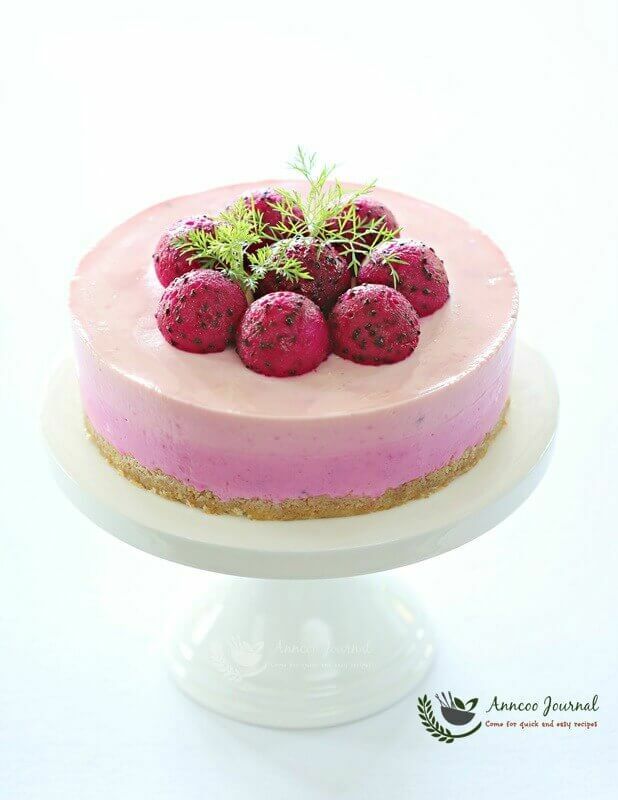 Hi Ann, thanks for the recipe, this cheesecake looks so pretty so I tried it today, I have a question though, the cheesecake batter turn out to be very thick, I wonder if it is because I used too much gelatin? I did follow your recipe though if I read it correctly – Tablespoon? The cake is in the fridge, I will take it out tomorrow morning to check if it looks right, will let you know, thanks for sharing! 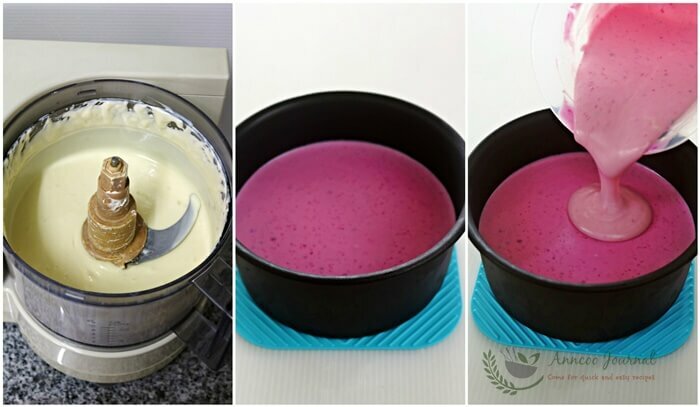 Hi Kristy, 1.5 tablespoons of gelatin is just right for the total mixture of about 620g (cream cheese, yoghurt, melted chocolate and dragon fruit puree). Due to our very hot weather here, the mixture is not thick, I mean the mixture is pourable. Please let me know how you find your cake tomorrow after cutting. Thanks Ann, it taste really good even though the mixture appeared to be a little bit thick. Thanks for sharing your wonderful recipe! You’re welcome, Kristy 🙂 You can add a little milk next time if the mixture is too thick. It’s a lovely home made classic cake specially for birthday girl. Ann, what a stunning cheesecake! I love the color! 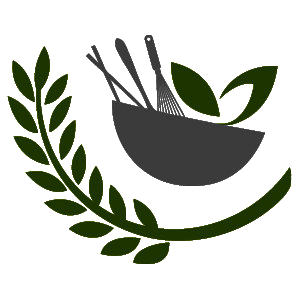 Is the gelatine in your recipe powder or leaves? Hi Alice, Sorry that I didn’t put it clear. Is gelatin powder. I was exploring the internet and found your website. I would like to tell you that you have shared a great recipe. I will try your recipe today. Just like every your creation, this one is very beautiful too. Thumbs up for you, Ann.